On Instagram, a photo was posted of the three actors. At first glance, it just seems like they are posing for the camera and having fun. However, taking a closer look, it could tease some interesting Days of Our Lives spoilers. 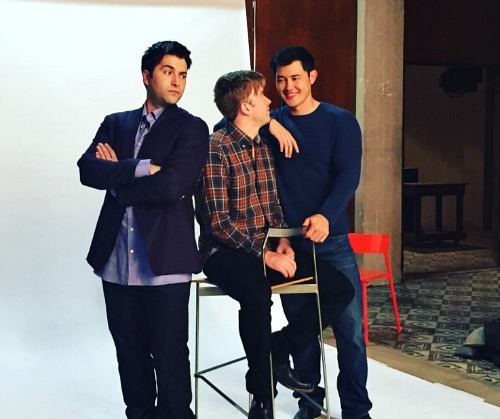 Will Horton is in the middle on a stool. To his right, is Paul, who has his arm resting on Will’s shoulder. They are gazing into each other’s eyes and smiling at each other. On the other side of Will stands Sonny Kiriakis. Arms folded defiantly, he has his back toward them. However, his head is cocked to the side with his eyes giving them a sideways glance. The expression on his face is one of jealousy and anger. It also appears that he could be pouting. Days of Our Lives spoilers reveal that Sonny finds out Will is alive. Even though many fans assume that it is “PaulSon” vs “WilSon,” we could be looking at a different outcome. Will he even remember having a relationship with Sonny? Will he recall the drama with Paul? Even if he does, two years is a long time to be apart from loved ones. The “WilSon” connection just might not be there anymore. What do you think will happen with Paul, Sonny and Will? Keep watching the NBC soap and check back with CDL for the latest Days of Our Lives spoilers, updates and news.